It's time you enjoy the journey. The most complete and popular camping app of all time helps you do that as you find and filter places and services with or without internet. Tents, RV resorts, parking lots, fuel, rest areas, repairs, tunnels, even inclines. Extensive filters and thousands of points unique to this app for a one time price, free updates & no ads. "Packed with comprehensive information. For those with more discerning tastes in campsites & RV spots. " - NY Times "Whether you're looking for RV grounds with full amenities or far-flung campsites for a rough getaway, Camp & RV has you covered." -MacNewsWorld Starbucks featured app Has data seen in "Harvard Business Review" & rated Excellent by Wired Mag "The essential camping app - This is a must have app." 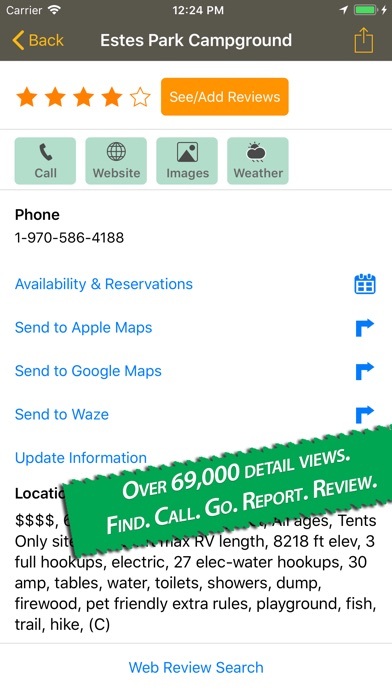 -appadvice.com "Camp & RV app is a must." -Womans Day "Best iPhone App for a Road Trip" -Techlicious "By far the best of the camping apps" -Motorhome Forums "When looking for a place to camp, nothing beats AllStays." -padgadget.com "Travel", "Summer", "Sun", "Road Trip" & "Great Outdoors" featured picks on App Store Why is it the top camping app? 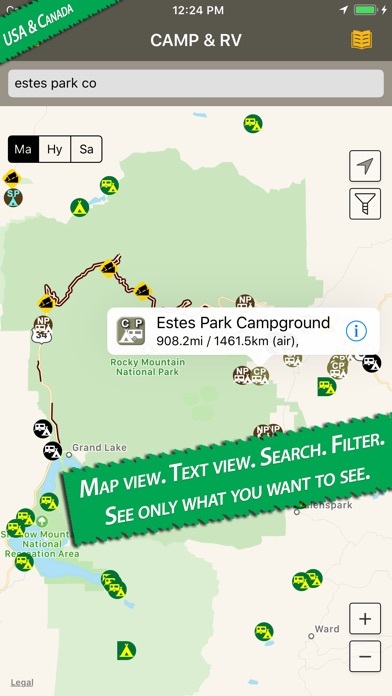 +See at a glance right on the map if a place accepts RVs or tents, is hike-in or is dispersed +One touch to check availability and book at over 4,000 public campgrounds +Thousands more places than other sources. +A true universal app for iPhone, iPad & Touch. +Map adds points on the fly as you scroll. +Filter the map by type and by over 30 amenities. Hundreds of possibilities. +Want to see only campgrounds or tenting and no extras? One touch does it. +Data is on device for speed and accessibility. Including text directions. 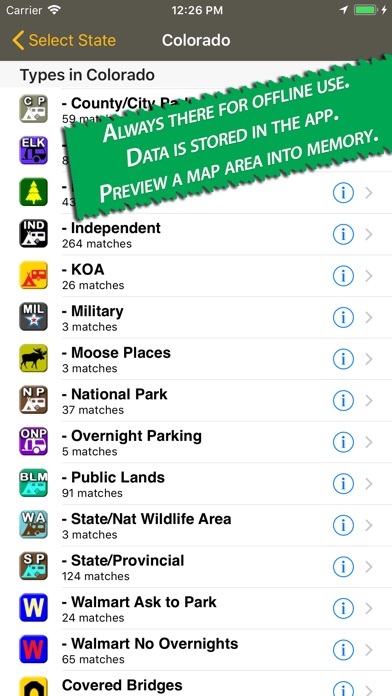 +Lookup data by type, state & city without service. +Photo and review searches that use the power of the entire web, not just one source. Add your reviews. 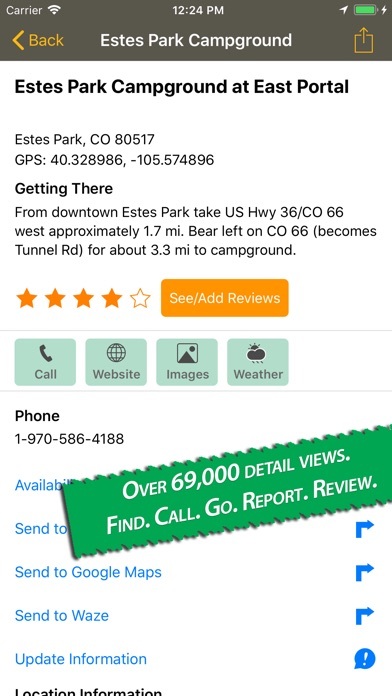 +Check NOAA Weather by GPS, not at some city airport +Extras all in one app: Truck and rest stops, dump stations, supplies, RV service, & road grades +Quick resources for road conditions, emergencies and various state laws. CAMPING: -Over 32,000 campgrounds: (US & Canada only) -Private -Public Lands -National & State Forests -National & State Parks -County/City Parks -BLM -Army Corps -Military famcamps -KOA, Good Sam, Escapees, Passport America, 1000 Trails, ROD, RPI, AOR, Coast to Coast, Elk, Moose -Primitive hike-in/boat-in/rough road spots that other apps exclude. CAMPGROUND DETAILS: -Official website, booking, phone, directions, reviews, open season, elevation, rate range, sites, hookups, amps, big rigs, tents or no tents, clubs, water, showers, toilets, tables, pool, playground, laundry, propane, pet-friendly, RV dump station, age restrictions, storage, firewood, boat launch, GPS decimals and more. EXTRAS: + Walmarts (with overnight parking reports), Sams Club, Costco + Overnight Parking like casinos, Elk & Moose Lodges and more. + Truck Stops with amenities. + Stores (Camping World, REI, Cabelas, Dicks, Bass Pro Shops, Big 5) + RV dealers and services + RV Rentals (Cruise America, Road Bear, El Monte) + Rest Areas, Welcome centers and turn outs by heading. 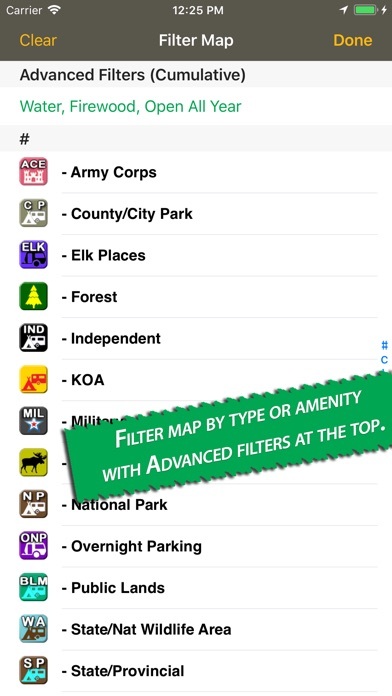 + Road grades FILTERS: See only tent places with showers; RV parks with a club discount, 50 amp and LP; cost club stores with gas; truck stops with a Subway. NO SERVICE? Much of this app will always work. The data is stored on your phone while the app uses GPS, so constantly calling out for information is not necessary. App is fast even in remote places. Offline maps. Scan your route ahead of time to load maps into memory. They will be there when service is not. SAVE YOU $ $$ Find a overnight in a parking lot. $$ Find a dispersed or forest site beyond the $40 park your book lists. $$ Lighten your load, save fuel by not buying as many books year after year. SUPPORT ** Explore it. See much more at http://www.allstays.com/apps ** US & Canada data only. Requires internet to load maps into memory. Questions/requests? Email: [email protected] for a real reply.